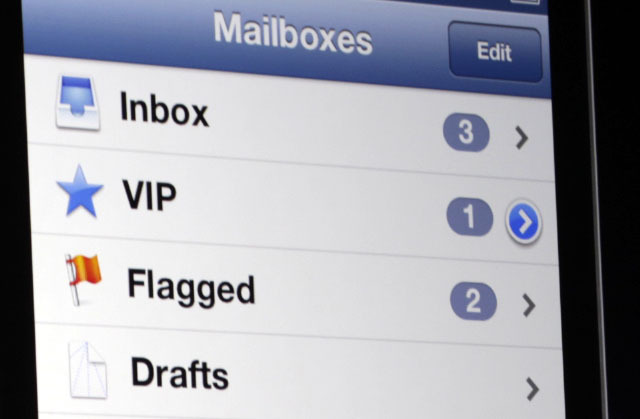 To quickly access an email you have previously started in drafts, hold down the write an email icon (bottom right) while in mail. Useful if you like colour in your mail, and you have started a few templates in mail on your computer where you have more control, than bold, underline and italic. As if your accounts are sync he'd you can use these colour draft on your iPhone. Your VIP's making a contact a VIP means that even if your settings are on silent you VIP mails still comes through and with a notification too. Social media and sharing your stuff just got easier with Siri. Asking Siri to Send a tweet and post to Facebook does just that. Looks good too, with a paperclip holding your bland message, Siri then asks what would you like your message to say? When finished she asks, ready to send? In addition Siri has been swaying up on sports, she knows all the stats and when your teams next game is. This hasn't changed much since it first arrived on iPhone, now instead of an annoying prefixed sound or ringtone you can select s track from your music library to wake up too, kinda old school, kinda nice. Really get off the grid! Your favourite contacts can still get through and if your are repeatedly called, say in a really OMG emergency then the second times the caller tries they get through. Still don't fell like answering the swipe upwards on an incoming call to send a text, eg just arriving or call you later, straight from the incoming call screen. What to limit when you can be poked, tweeted or spammed, set your quite periods to avoid the digital jungle. I take a lot of pictures, and love the photo stream, sharing is a bit of a pain though. Only a few photos by email or more on a potentially costly message. Now you can select certain photos to share and set up who will share your streams. Great for sharing your offsprings latest achievement with the olds.